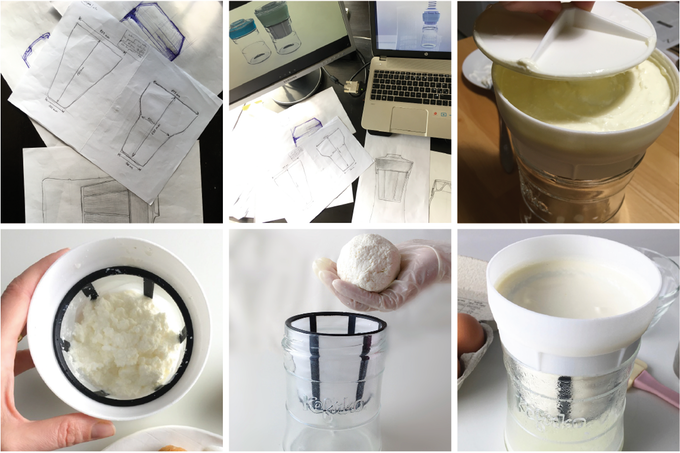 It’s never been easier for users to create their own cheese at home using kitchen gadgets. The cheesemaker enables users to make their own Kefir which is a fermented beverage filled with probiotics and other healthy ingredients. It’s made by leaving reusable cultures known as kefir grains in a liquid such as milk or sweetened water for 24 hours. The grains are comprised of proteins, polysaccharides, and a mixture of several types of micro-organisms such as yeasts, aroma, and lactic-acid-forming bacteria. According to the maker’s Kickstarter, kefir boosts the consumer’s immune system, improves digestion, helps with cholesterol regulation, and has numerous other beneficial effects. There are just four steps users need to follow to use the device. Pour, strain, flavor, and serve. Users can control the kefir’s thickness by deciding how long it strains. From a few hours to make a thicker kefir that can be used for dips, to overnight for creamy cheese, and 1-2 days for semi-hard cheese. Kefirko is comprised of a handful of components including a lid, mesh basket, ring, and glass jar. The lid covers the cheese while it’s still straining and prevents the cheese from absorbing odors while in the fridge. The mesh basket separates the whey from the cultured dairy. The ring adds more volume to pour the kefir into the mesh basket. Finally, the glass jar is used to preserve the whey that remains when straining kefir. As with many other kitchen gadgets, however, there are a few other tasks Kefirko can assist with. From making iced tea, iced coffee, or almond milk. It also enables users to prepare a variety of dishes such as homemade mascarpone, mozzarella, Greek yogurt, and much more. In addition to the Kefirko, there’s the Kefirko 2 which is a specifically designed glass jar for the easier making of milk and kefir at home. The primary differences are a better grip of the lid and improved airflow. Additionally, there’s the creation of the Scrapper which is a tool for mixing Kefir grains during straining to ensure they easily separate from the kefir drink. It also helps to make straining faster and more practical. Pricing for Kefirko starts at $25 and the estimated shipping date is January 2018. At the end of the campaign, users will be able to choose from four different colors – grassy green, playful pink, gorgeous gold, and blissful blue. We aren’t sure why there’s such a hot demand for Kefirko, but there’s certainly a market for it. I think this is pretty cool. It is small, seems easy to use and if it provides the cheese that it claims, this cheesemaker is pretty nice! I just visited the campaign and cannot believe how much money it raised. As the reviews come out about this product it will be interesting to see how other companies play the “copycat” game and try to release similar products. For that price and the fact that it can help with a few other tasks in the kitchen, I say that is not bad at all. Hmmm, a cheesemaker. Now that is something that I didn’t think I would ever see on a consumer level.